Meet Piper. She's a 5 1/2 year old Golden Retriever and her dad, Bryan Tenenhouse, is a former colleague of mine. I met Piper for the first time back in the Fall. She and her dad were out for a stroll and I was sitting at a sidewalk cafe, checking emails. She's training to be a service dog. 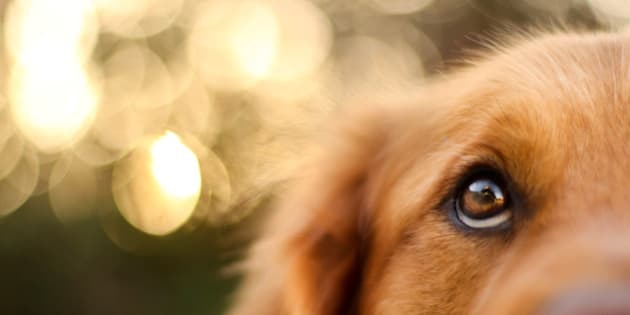 Golden Retriever eyes of devotion. Meet Piper. She's a 5 1/2 year old Golden Retriever and her dad, Bryan Tenenhouse, is a former colleague of mine. I met Piper for the first time back in the Fall. She and her dad were out for a stroll and I was sitting at a sidewalk cafe, checking emails. She's a real beauty and everyone walking by just had to stop to admire her and give her a few pats. She was completely unfazed by it and just sat there, enjoying the attention, letting them do whatever they wanted. She is so sweet and placid. He told me she'd been that way since the day she'd come into his family's life as a pup and he'd been thinking of signing her up as a St. John Ambulance therapy dog. Next thing I knew, Bryan had proudly posted this photo of Piper, in her volunteer "uniform" on Facebook. So I decided to check in with him, to see how it's going. She knows where she's going and Bryan told me she gets very excited, leaping out of the car as soon as they get there, literally running to the front door. 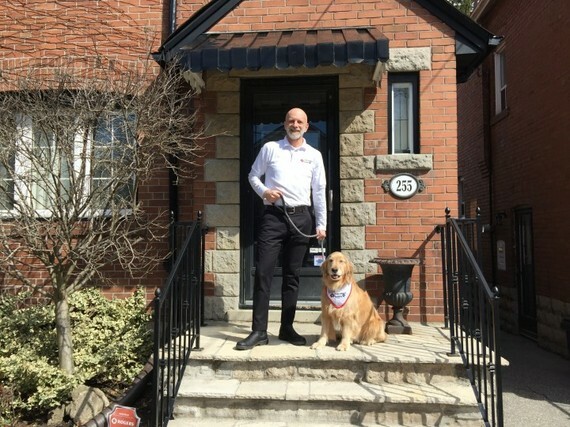 Her first clue probably comes when Bryan puts on her special St. John Ambulance bandana. And dogs do seem to have an uncanny ability to remember familiar routes. My dog knew when he was going to the Vet and would start panting, barking and jumping nervously when we were still blocks away. When Bryan and Piper first arrive they're greeted by a human volunteer and, together, they head over to a common room on the main floor. Needless to say, she's kept on a leash, held by Bryan. They walk around to each resident and sit for a while. They love petting and hugging her. And she loves licking their hands, which they also enjoy. One resident, who's 104 years old takes Piper's head in both her hands and rubs her behind her ears. Bryan says it's a toss-up as to which one of them enjoys the encounter more. Needless to say, they've become fast friends. In fact, Piper recognizes all the residents and snuggles more closely with them then she did at first. One gentleman, who's pretty much a loner when Piper's not there, asked Bryan one day if he could hold the leash. It's against the rules, but one of the volunteers told him that he could bring a second leash with him the next time, and that would be okay. He waits for them now, every week, and walks around the entire facility with them, as they make their rounds, going from floor to floor. The staff have told Bryan that all the residents are more verbal and engaged when Piper's around. She's greeted warmly everywhere she goes, except for one woman. She's not hostile or anything, but she ignores Piper. She has no interest and seems oblivious to her. But she flirts with Bryan and has even suggested that "they go out sometime." ST. JOHN AMBULANCE puts you through your paces, as they should. First you have to pass a police check, which costs $20, which you pay for at an initial orientation that's just for the human. The clearance takes several weeks, after which you can book a 2 ½-hour qualification testing session for you and the dog. The evaluation starts the second you both walk through the door. You're left, in a waiting area, with other dogs and humans. They want to see how your dog reacts to strangers, if they're yappers, whether or not they're aggressive or nervous (nervous dogs tend to pee). Dogs who don't get through this initial phase without an incident get to go home right then and there. Everyone else then goes through a series of about eight or 10 different exercises. For instance, they ask you to walk past someone with a walker. All of a sudden, they "accidentally" knock the walker to the floor. They want to see how your dog navigates around the walker and also how he or she reacts to the sudden noise and confusion. The last thing anyone needs is a hyperactive dog whose leash gets caught in an elderly person's legs or walker, which causes them to fall. When you graduate, if you do, at the end of the day, everyone gets their uniform: A St. John Ambulance polo shirt for the human and the bandana for the dog. You're given a choice of facilities and locations and you're ready to make a difference in people's lives. And, frankly, in your own as well. Bryan now also wants to volunteer at Sick Kids with Piper. First they have to rack up 72 volunteer hours and then there will be extensive training for both of them. Piper is going to have a baby brother in a few months and, if he's got the right temperament, I'm told that Piper will teach him the ropes and he'll follow in his big sister's paw prints and become a volunteer as well. So he'll not only learn how to heel, he'll know how to heal as well. Awwwww. As if we needed any more reasons to love our canines! Interested in volunteering with your best buddy? For anyone living in Toronto HERE'S A LINK that spells it all out. 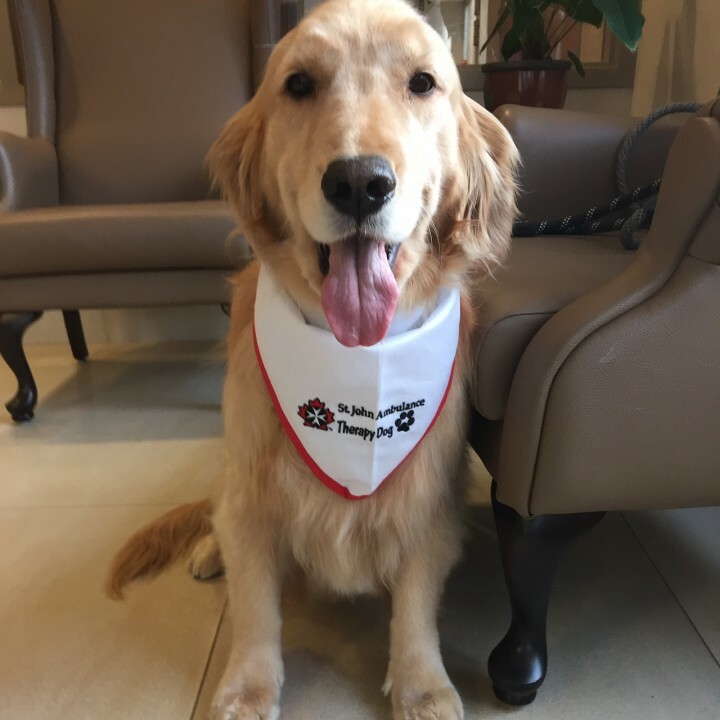 The opportunities may vary from province to province and also from state to state in the U.S. so it's best to Google "how to volunteer with your dog" or "become a therapy dog" wherever you live.